At our house we always seem to be slightly behind and end up cramming to get our father's day gifts done the night before that special day. Sometimes they don't go as planned and we spend a frustrating time figuring out what to do. This year we decided to change this (maybe the rain, rain and more rain had some impact on our decision) and have already made some gifts. Here is a simple project for Father's Day that the kids can help make. 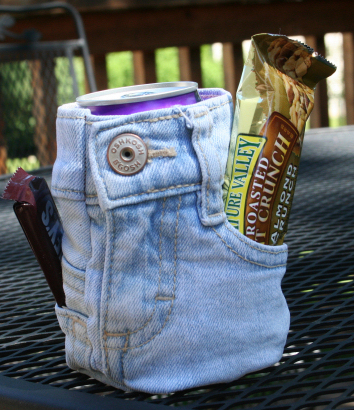 It will hold any soda can sized drink or a bottle of water. We used a pair of the girls jeans that had holes in both knees from playing horsey all winter. It's sure to be a hit this Father's Day! 1. 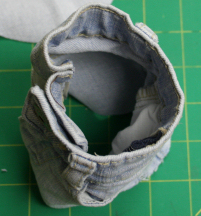 Measure an 11 inch wide by 5 inch high piece of denim from jeans and cut. 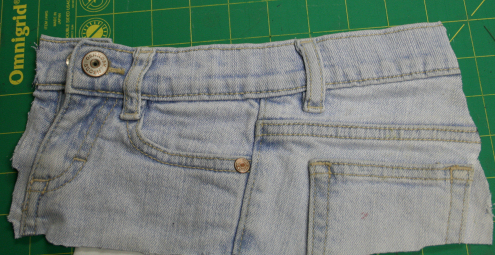 Because the old jeans were just a size 4T we were able to include pockets and the zipper for interest on the first one. Ok, with kids it doesn't have to be exactly straight right? 3. With right sides together sew down the side 1/4" from the edge. You should have a tube. 4. 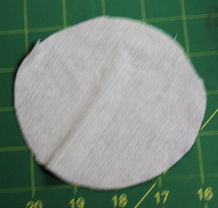 Trace a 4.5 inch diameter circle onto another piece of the denim and cut out the circle. I marked the circle with a wide marker and I helped. 5. With the tube inside out, pin the circle (with wrong side out) to the bottom and machine stitch 1/4" inch around the edge easing the fabric to fit as you go. The kids can pin it but you'll probably have to do the sewing on this one. 6. Turn the piece right side out and it's ready to use. 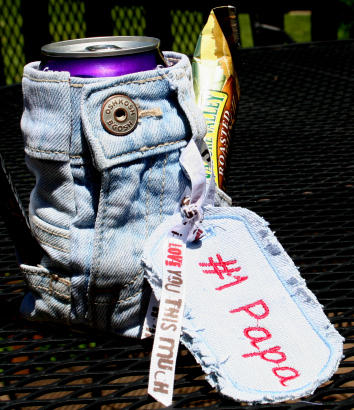 Load it up with a favorite drink and put treat or two into the pockets for Dad (or in this case Papa) to enjoy! 7. We weren't sure where to embroider on this one with all the pockets and zipper so we made a tag in-the-hoop and tied it on with a ribbon. You can download our tags here. There is one for Dad too. The designs are applique but we didn't do the trimming We slid one piece of denim under the hoop and put one on top and embroidered the whole design. Then I traced around the outside a half inch or so cut it out and let her make slashes in the fabric to create a fringed look. Much easier and she got to feel like she did more "all by herself". We had some fun ribbon left over from Valentine's Day and it turned out perfect. She can't wait to give Papa his gift. And to be sure Papa will remember all those cold winter days when they pretended to be wild horses for hours on end. 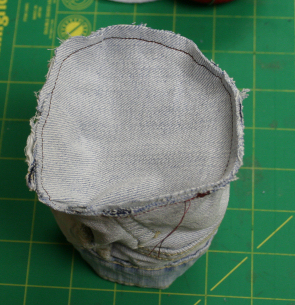 If you need more instructions for sewing the cozy read the Keeping It Simple blog on Making Water Bottle Carriers. These would be great if Dad likes to walk, run or bike. And go here to see what we made for Papa last year. What a great idea. Love it. who doesn't have old jeans laying around? Embroidery Ink Computerized Embroidery of Yesteryear – Well Sort Of!